Ask any experienced outdoorsman what is necessary to bring on every single trip, and you’re likely to hear one answer every single time. Rope. The original multi-tool, rope can be used for just about anything. It can do anything from making your life on the trail or campground easier to serving as a must have object in a dangerous pinch. Read on to find 5 ways to use rope on your next outdoor adventure. If your next stay on the campsite is going to be an extended one, you’re probably going to have to wash your clothes at least once. That is, if you don’t want to scare off all the wildlife and campers in your vicinity with a raunchy stench. Simply tie both ends to tree trunks or branches to safely hang anything and everything from the line to dry. Bank fishermen who get a little too close to the water may also find this use handy. Got something heavy that needs to be moved? You can get much more force and man power with several people at the end of a rope than you ever could by trying to lift it. 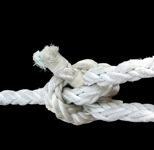 Just tie a secure knot (usually a slipknot in this scenario) around the object and pull in the direction you want it to move. Fishermen and swimmers, besides always having a life preserver or life vest on their boat or their person, should keep a lengthy piece of rope handy as well. In situations when someone has fallen overboard or lost control in the water, it can be used as a line to tow someone in. If a party of yours is navigating challenging terrain or crossing a body of water with current, rope really comes in handy. Send out the best climber or swimmer to lead the way, and have him secure the rope when he or she has reached the goal destination. All the followers can then grab hold of the rope as a sort of crutch in their efforts to cross the area. When you find yourself in need of shelter, a piece of rope and any old tarp will often do. An A-frame shelter is exceedingly easy to make with them. Just tie the rope between two sturdy objects at the desired roof level, and lay the tarp over it. To secure the bottom and keep the makeshift shelter taut, lay rocks at the point where the tarp meets the ground. In addition to these five, there are literally thousands of other uses for rope in the outdoors. A good old fashioned rope is easy for modern outdoor enthusiasts to dismiss because it’s not battery operated or especially “cool”, but it has been a preferred tool in the wild for thousands of years for a reason. It works.